play in the preparation of young people for society and for work? What role can design education in schools play in the ‘creative industries’? 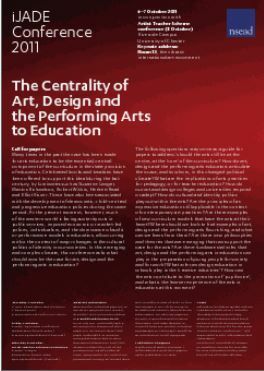 How can the arts contribute to the promotion of ‘pupil voice’, and what is the learner experience of the arts in education at this moment? programme occupy 90-minute slots and normally consist of three or four linked papers; one of the group (or an additional member) should act as a discussant, introducing papers or themes, responding and initiating discussion. One main abstract is required (max 500 words), including a paragraph on each paper as well as an introduction to the symposia. A selection of authors (12 max.) will be asked to write their papers up for publication in iJADE. Teacher Scheme conference – see www.nsead.org for information and registration. Conference includes free session on academic writing for journals for new researchers led by members of iJADE’s editorial team.